Super Bowl fans are heading into New Jersey on Sunday, where the championship game will be played outdoors in a cold-weather city for the first time. Whether it’s the TV ads, the halftime show or the athletic competition itself, the National Football League plans Sunday to draw a big audience. A majority (55%) of Americans said they were looking forward to the Super Bowl this year, according to a Pew Research survey from early January. That number is similar to the share of Americans looking forward to the upcoming Winter Olympics in Sochi (58%) and greater than the number looking forward to soccer’s World Cup tournament in Brazil this summer (22%). 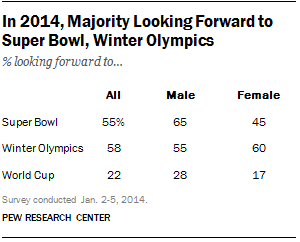 A significantly greater share of men than women said they were looking forward to the Super Bowl (65% vs. 45%), as well as the World Cup (28% vs. 17%). However, no such gender difference existed between those looking forward to the Winter Olympics (55% of men, 60% of women). Last year’s Super Bowl drew an average TV audience of 108.7 million viewers to CBS and prompted some 26.1 million tweets, according to Nielsen. While there were more viewers in 2012 and 2011, the number of Super Bowl watchers in general has steadily increased since Super Bowl I in 1967.